These days, people don’t just own gadgets — they have a relationship with their brands. No greater evidence of that exists than the ties between end users and their Apple products. Seems that more people are putting themselves into the poor house by tricking out their whole household with i-devices, says Reuters. Adding to the cash drain are those pesky Apple “taxes,” as the news service calls it. In reality, those aren’t really taxes at all, but costs for related items that further embed users into the iOS or Mac eco-system — like iTunes music, apps, games and movies, or accessories. The Lightning port is a perfect example of this. The company charges $19 for a proprietary sync/charge cable, while microUSB versions that fit other other devices are readily available for just a few bucks. And that’s on top of the retail price for the device itself to begin with, which many geeks consider highway robbery for the specs. However, none of that deters devoted fans, whose appetite for Cupertino’s wares has only gotten more voracious. 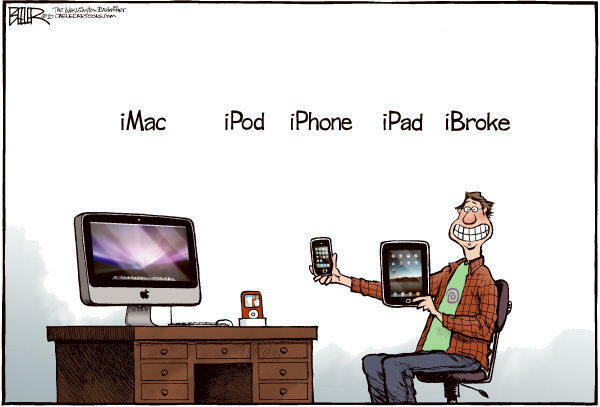 U.S. households spent an average of $150 on Apple products in 2007. That figure grew to $295 in 2010 and shot up to $444 last year, says analyst Katy Huberty of Morgan Stanley. And that’s just the tip of the iceberg. The company is expected to launch a hi-definition television, and if that pans out, Huberty thinks that the Apple spending will double per household by 2015. That would mean households in America would be coughing up $888 per year to pledge their Apple loyalty. In this uncertain economic period, with the threat of a “fiscal cliff” on the horizon, that’s quite a chunk of change to blow. But that may be exactly what many American households may do. A recent survey by Morgan Stanley and AlphaWise reports that almost half of U.S. consumers are interested in an Apple TV — so much so that they’re even willing to spend an average of 20 percent more for it than current HDTVs. The responses, which ranged from mildly to extremely interested, totaled a whopping 47 percent. Compare that to pre-release interest in the iPhone, at 23 percent (February 2007), and the iPad, at 21 percent (April 2010), and the potential for an Apple television looks pretty massive. And that’s why Huberty’s so confident in her estimate of future Apple spending. But there’s one thing she doesn’t seem to account for in her assessment: While people upgrade their smartphones every year or two, or their laptops every few years, many consumers hang on to their television sets for a lot longer than that. You even spot those old tube sets on occasion, and those are practically antiquities now. So if the “iTV” (or whatever it’s called) is to blame for an uptick in Apple spending, that would only be temporary before leveling out. Where do you stand? Is your household among the Apple-only households out there? 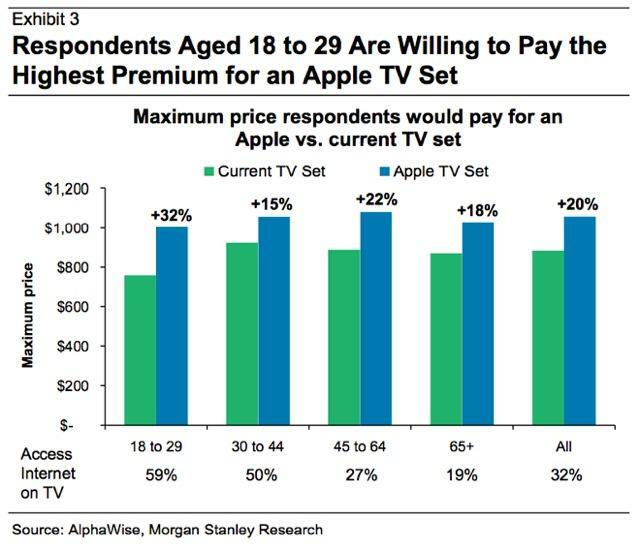 If so, would you pay a premium to add an Apple-branded HD television to the mix?